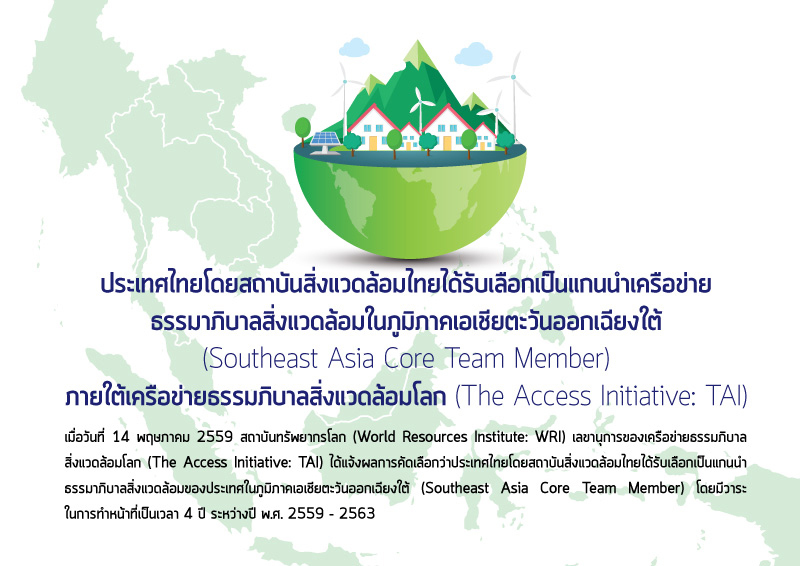 On 14th May 2016, the World Resource Institute (WRI), the Secretariat of The Access Initiative (TAI) announced that Thailand, represented by Thailand Environment Institute (TEI), has been selected to be Southeast Asia Core Team Member of The Access Initiative (TAI) for a 4 year term: 2016 - 2020. TAI is the world largest network of civil society organizations dedicated to ensuring that local communities have rights and abilities to gain access to information, and to participate in decisions that affect their lives and their environment. Members from around the world carry out evidence-based advocacy to encourage collaboration and innovation that advances transparency, accountability, and inclusiveness in decision making at all levels.